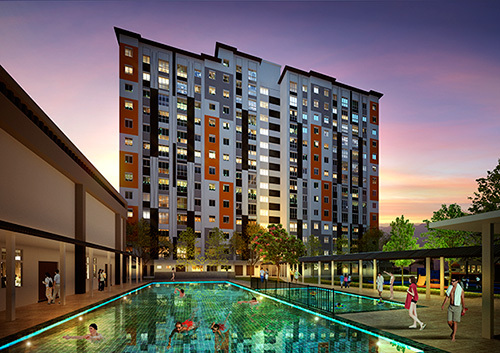 Aronia Apartments, WCT’s fourth “Rumah Selangorku” housing development project features two exclusive blocks of 14-storey affordable residential buildings. Located in Bandar Parklands, this freehold development boasts 3-bedrooms apartment units with a total build-up of 900 sq ft.
Aronia Apartments is priced at only RM250,000* and it comes with two (2) car park bays. Register now to receive the latest information and launch updates regarding the project! Malaysians aged 18 years and above. Household income must range between RM3,000 to RM8,000 per month. The applicant (husband / wife) must not have any type of residential property in Selangor. Applicants who already have a low-cost home for 5 years or more can apply on condition that there is evidence stating the sale of the current low-cost home. Single applicant with family dependents may apply. Purchase the home to live in and not for rent. Transfer is only allowed after 5 years. Registered with Selangor Property and Housing Board (LPHS).